You know that you would like to share good news with your family and friends whenever you have some – it is the natural order of things. The thing is, the same can be said for music, too, which is why a portable speaker does come in to be pretty handy when you think about it, since a pair of headphones can only go so far – not to mention hygiene issues when you pass your personal pair around the entire room so that they can listen in to what you think is the next best tunes since Hotel California invaded the airwaves all those years ago. Why not make a meal out of it with Stelle Audio’s latest Audio Go-Go speaker? 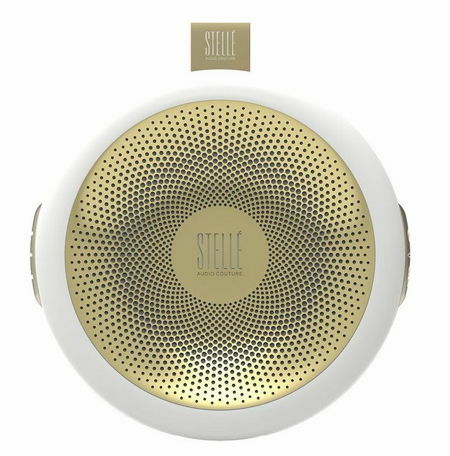 As its name suggests, the Stelle Audio Go-Go speaker is the perfect tool for those who are always on the move, being a stylish and mountable speaker. The Go-Go Speaker will boast of sleek curves, a chic white and gold finish, where all of its are encompassed within a lightweight frame. Thanks to its eye-catching aesthetics, the Go-Go speaker will be able to find a place in just about any home, where it will be rivaled only by its ultra-portability and functionality that offers users on-the-go the freedom to listen to their music regardless of the setting that they’re in – although one is not recommended to make use of this in full blast when you are in a public library. Tipping the scales at approximately half a pound, the Go-Go Speaker will cater for all types of active individuals, ranging from bike enthusiasts to new parents. Expect the Go-Go speaker to feature a couple of easy-to-use attachments, which will include a removable hanging strap that attaches to any pole or can be used as a wristlet, alongside an adjustable pivoting speaker mount that makes it the ideal tool for bicycle and stroller handlebars. The mount itself can be screwed onto a ball pivot, where it will then boast of an easy to use two-push button release for additional security.